Treatment Room : Part 1 | Design Ergonomics Inc. The following is a reprint of an article that was featured in “Dental Economics” June 2002 issue- entitled, “Ten Essential Elements of a Productive Treatment Room” Part 1 by Dr. David J. Ahearn. All Rights Reserved. Think your space is productive? Think again; it probably isn’t. Let’s face it. Productivity in most dental practices is not very impressive. We may work hard, but we don’t get that much done. Heresy, you say! Let’s think about it for a minute; a car factory can produce an economy car for $10,000 using hundreds of vendors, thousands of products, and years of planning, and they still can be profitable. For $10K, what can we do? Make a small handful of crowns? How many computer chips get made in a clean room in an hour? And to think that we complained about masks and gloves slowing us down! I hope to bring to your attention both a handful of broad, basic concepts that relate to productivity and a great number of little, often overlooked items that will make your daily practice more pleasant, productive, and profitable. We’ll address many elements of office design as they relate to performance, as well as technology and even scheduling. With this article, I would like to destroy some preconceptions, and outline some opportunities that will benefit you. Dental office design is all too often overlooked as a source for true productivity improvement. We may think in terms of extra space – perhaps extra operatories – but often, we go ahead and build what is essentially an enlarged version of our last office. That makes no sense. We hated the torment that we received in our cubicles, but then we go buy the same type of setup in our practices, surrounding ourselves with all of our stuff in one favorite room and trying to do certain procedures in specific rooms. Hopefully, you will be encouraged to stop thinking of treatment rooms as complicated, cluttered, technology-crammed spaces. What, you say, take away my technology? Absolutely not! Let’s liberate it instead. Let’s look at the first five elements of a productive treatment room. In the next issue, we will discuss the other five elements of operatory productivity. Your new operatory shouldn’t cost a king’s ransom. There is little correlation between total operatory cost and practice productivity. What works in some practice environments may be entirely inappropriate for a different type of practice. Further, your operatory cost is far more than the sum of the equipment purchase costs. To be successful, you must look at total installed cost, which includes the room configuration (plumbing, etc. ), plus the installer’s expenses and long-term maintenance, in addition to the simple cost of equipment. Careful planning, which minimizes plumbing, electrical, and cabinet expenses, can reduce your costs considerably. Saving money here allows you to make needed improvements to other areas of the practice. Before all else, your new room must be easy to practice in, day in and day out, patient after patient. Simple, inexpensive choices made in the planning stages will have an enormous impact, saving hundreds of staff hours yearly and freeing your office for more productive activities. Plan your space by considering how you will most rapidly reintroduce sterilized equipment, how you will handle lab cases, and how you will deal with patient records. Build into your system a management plan for all of your practice technologies. 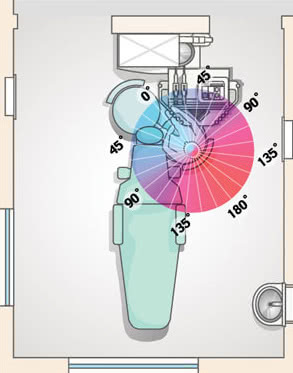 FIGURE 1: All supplies should be consolidated within a 90-degree angle reach of your assistant. FIGURES 2A and 2B: Design should allow for quick conversion from two-handed to four-handed dentistry. Your new room should also permit right and left-hand use whenever possible. Do not lose the opportunity to employ a talented prospect due to your office’s lack of opposite hand-delivery capabilities. 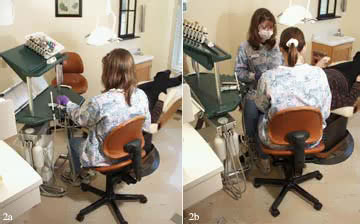 Learning how to work in a strange dental environment can be a daunting challenge for new employees. As the labor pool shrinks, it becomes increasingly important to create an easy plan for dental delivery. Tedious memorization must be kept to a minimum. Coordinate your stocking plan with your sterilization and resupply protocol. This is an excellent time to upgrade your entire instrument and supply deployment system. If you have not converted to a tub and cassette system of delivery, this would be an appropriate time to do so. Cassettes greatly reduce instrument handling and related errors, while simultaneously creating a simple system for new employees. This method hastens setup and room turnaround, and you will need less equipment to get the job done. In our next article, we will discuss the next five critical elements: creating a compact operatory, planning for the future, allowing free access, making it easy to re-equip, and not scaring the patient.